One reason that so many sermons today lack anything resembling "The Stickiness Factor" is that they are monologues in which the person with the microphone has all the say. Sermons, as a general rule, do not provide opportunities for planned interaction between the one preaching and the ones listening. That is a rule that must be broken. Of course many preachers practice some form of unplanned interaction by just paying attention to the challenges of various members within the congregation. This type of interaction is certainly not to be overlooked, and if you aren't paying attention the lives of the people who attend your local church then it's time to start. This unplanned interaction is what Fred Craddock has in mind when he says, "[T]he listeners participate in the sermon before it is born. The listeners speak to the preacher before he speaks to them; the minister listens before saying anything" (Preaching, 25). That's good but, in my opinion, it doesn't go far enough. 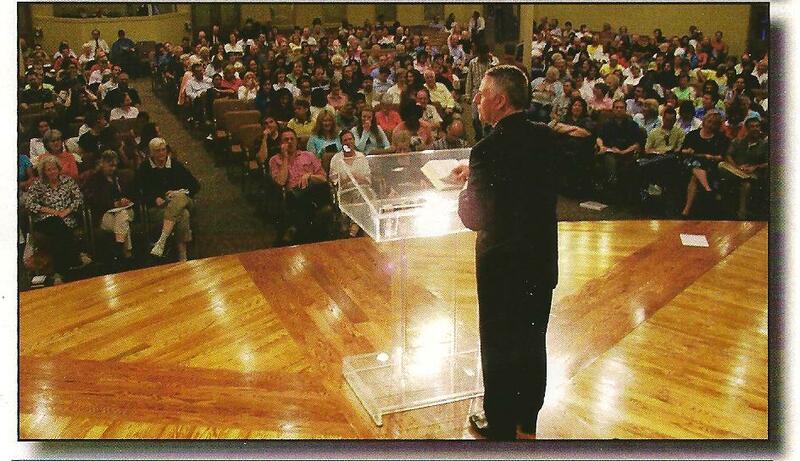 I believe that churches must begin to include planned interaction as part of what passes for a sermon. In other words, a sermon must be seen as incomplete until the preacher stops talking and starts listening to the responses of the people who are present. By Planned Interaction I mean, primarily, giving other people a chance to voice their questions, objections, and needs for clarification DURING the time allotted for the sermon. Why isn't this happening already? 1) "Sermonizing" reached its present form in the time after the Protestant Reformation (16th century) when most people couldn't read and were largely uninformed about the current events happening outside their towns. Change is uncomfortable so churches have kept the same format in place ever since. 2) To give a more contemporary explanation, preachers are thinking ahead to their podcast during which people can't interact anyway. Preachers of this sort have in their minds all the people across the world who will be helped and inspired by their sermons, all the while leaving the people in their midst disengaged. a) Most of those extra-curricular groups are attended by less than 50% of church members. b) People in general, and families in particular, are busier than ever and the time available to sit and get "chummy" with people you see once a week is quickly sliding down the list of priorities for most Americans...yes, even Christian Americans. c) Unless your church utilizes "sermon-based small groups" those who do attend those other formats are treated to ANOTHER lesson that is based on a different topic than the one that covered in the sermon so their questions related to the sermon are still left unanswered. Whatever the reason, sermons must change to include interaction. Preachers cannot continue expecting competent and informed people, who provide meaningful insights all week long at their places of employment, to show up each week only to be told, "Thanks for coming, so glad you're here. Now sit down and be quiet." However, I try to be a realist and I approach the element of interaction realistically. I'm well-aware that some people are in churches that have followed the same order of service for the last hundred years. For pastors in those settings, I believe a compromise can be struck on a looser meaning of interaction than the one I proposed above. In the looser meaning, I still insist that you must give people a chance to voice their questions, objections, and needs for clarification, but instead of doing it during the sermon, it should be done IMMEDIATELY after the worship service has concluded. If you desire your sermons to be "stickier" you must interact with those who are present by giving them a chance to speak and be heard. Sticky Sermons: Evolution of "The Stickiness Factor"
Soooooo, why not have the small groups directly after the Worship Service...and the "subject" is....whatever the Lord laid upon the pastor's heart to share with the congregation that day....or, organized home groups serving all the geograpical areas of the church that meet once a week and....again, the "subject" is that which came from the pulpit. To open your Worship Service to questions and discussions...would cease to be a Worship experience and it would be a teaching experience. The Holy Spirit can teach countless lessons to each individual believer as the pastor opens the Word and preaches from it, rather than giving opinions. The Holy Spirit takes the Word and places exactly what needs to be given to each individual. Hmmmm...sorta like Christ multiplying the loaves and fishes to meet everyone's need. I'll try to address to address your points in the order you gave them. 1) Why not have the small groups directly after the Worship Service and the subject is whatever the sermon was about? My Response: This assumes that churches have scheduled the worship service prior to the "Sunday School Hour" (as it's known in Southern Baptist Churches). I don't find much evidence to support that assumption as I drive around town and see church signs advertising that their Worship Service starts at 11:00am. But, for the sake of your point, let's assume that the order was: Worship Service followed by Sunday School classes/Small Groups. Then you could certainly utilize "Sermon-Based Small Groups" which I referenced in the post as a good thing (see my point "C" in the post), but I also noted that only half the people present at the Worship Service are usually involved in the extra-curricular meeting options. 2) Organize home groups in the community that meet once a week and use the sermon topic as the centerpiece of the discussion. First, because you're talking about something during the week, you must consider that people's commutes to and from work are long (especially from suburban areas in to cities). Randy Frazee points out in his book "Making Room for Life" that he didn't know many people who really WANTED to rush home from work, throw the kids in the car, and then dash off to a small group meeting where they stick their kids in another room after they haven't seen them all day. That is just one of the reasons that these types of groups generally have spotty attendance (why people who don't have jobs and/or kids don't show up is a different story altogether). Second, even if you use "Sermon-Based Small Groups" you are relying on another person to "get inside the mind of the pastor" to understand how/why he made the points he did or said the things he did in the way he did. That cannot be done by emailing the small group leader a discussion a few days beforehand. I highly recommend Mark Howell's article on the pros and cons of Sermon-Based Small Groups (available at: http://www.markhowelllive.com/sermon-based-small-groups/). 3) To open your Worship Service up to questions and discussions would cease to be a worship experience and it would be a teaching experience. My response: First, I'm only talking about that part of the Worship Service which is ALREADY set apart for "a teaching experience" that we call preaching. In my proposal, that doesn't change. The pastor still preaches and makes his case (under the authority of the Scriptures) to the congregation for why they should believe or implement what he is telling them. Adding questions to the mix doesn't change the fact the pastor is trying to teach something, and it certainly doesn't make that time cease to function as worship. It is simply calling attention to the fact that monologue is not the best form of communication today. Second, the Apostle Paul wrote to the Corinthian Church, "What then shall we say, brothers? When you come together, everyone has a hymn, or a word of instruction, a revelation, a tongue or an interpretation. All of these must be done for the strengthening of the church. If anyone speaks in a tongue, two—or at the most three—should speak, one at a time, and someone must interpret. If there is no interpreter, the speaker should keep quiet in the church and speak to himself and God. Two or three prophets should speak, and the others should weigh carefully what is said. And if a revelation comes to someone who is sitting down, the first speaker should stop. For you can all prophesy in turn so that everyone may be instructed and encouraged" (1 Corinthians 14:26-31 NIV). I think he would have said discussion and interaction add to, not detract from, the worship experience of the gathered community. 4) The pastor opens the Word and preaches from it, rather than giving opinions. My response: Even if all the pastor does is read the text of the Bible and never says anything additional (which is NOT a good strategy! ), he is engaged in giving someone's opinion. That's because all our translations of the Bible required their translators to make decisions on how to render a word or phrase from the original language of the manuscripts. Those translators made those decisions based on opinions (called presuppositions). Those opinions/presuppositions are well-informed opinions, but opinions nevertheless. That's why, right or wrong, some pastors won't use the NRSV, TNIV, or NLT Bibles - they don't agree with the gender-inclusive language the translators chose to use. Even the choice of translation is evidence of the pastor's opinion. But all of that is just related to English translations of the Bible. Once the pastor begins commenting and making points (which is part of preaching) then he is surely engaged in giving his opinion. Granted, he may call it his "conviction," but a conviction is nothing more than an opinion that has been crystalized by time, education, and experience. And on the subject of education, we can be sure that where a pastor was educated will influence his opinions. A pastor educated at Duke Divinity School will have opinions that are quite different than someone educated at Southeastern Theological Seminary (and there are plenty of schools in between those two on the theological spectrum). But fortunately, having and giving an opinion is not a bad thing. I am arguing in this response that it's a necessary thing. I am arguing in this blog post that it's only a bad thing when everyone is expected to listen to one guy's opinion without giving their own. All that to say, wouldn't it just be easier and more effective to just do it while people are already there and the questions are fresh in their minds?